More than a year ago, we wrote an article pointing out the flaws in the U.S. practice of measuring a car's gasoline use with the familiar miles-per-gallon (MPG) measure. Now, no less a body than the august National Research Council has agreed with us. As it noted in a pre-publication summary released by the National Academy of Sciences: Fuel economy data cause consumers to undervalue small increases (1-4 mpg) in fuel economy for vehicles in the 15-30 mpg range. As well as the MPG recommendation, the report concluded that a combination of existing technologies could meet the now-enacted increases in corporate average fuel economy (CAFE). But it also noted that making cars more fuel-efficient would raise their cost, and that the payback for such measures depended entirely on the future price of gasoline. Voelcker also says this about his original March 2009 post on MPG: "And if you still don't believe us, read the entire original article--which caused, ummmm, quite a lot of controversy when we first published it, and continues to generate readership and interest." We thank Mr. Voelcker for his willingness to stir the pot and live with the consequences. Discovery News picked up Voelcker's post and summarized the fuel consumption argument. The panel also reiterated what we at The Car Connection and our colleagues at Green Car Reports have argued in the past: that the information should, be displayed to consumers in terms of fuel consumption (amount of fuel used per hundred miles, for instance) as well as traditional miles per gallon. Most of the rest of the world shops for vehicles based on consumption, as it relates directly to fuel costs (and CO2 emissions). And Thom Cannell and Allene Stark at the Autochannel's Detroit Bureau provide an industry perspective on the report, noting that the "investigators talked to all the key players; suppliers, car makers, and governmental units. They took things apart to understand costs, they made informed guesses when no one would divulge proprietary plans." Their main conclusion is that near term fuel savings must come from improvements on vehicles with conventional gasoline engines. The article provides a useful summary of the feasibility of different technologies. We need to shift to a different way of thinking about fuel consumption. 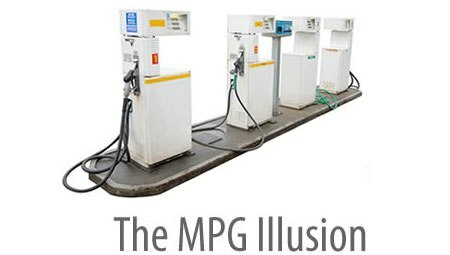 Our familiar MPG must be replaced by gallons per mile or at least appear on the window sticker. Why? GPM (we think that it should be GPM/100 miles as in Europe’s L/100km) more accurately depicts your out-of-pocket costs, or what you pay for what you get. Think it’s crazy? Which of these is a better deal: making a car that gets 50 amazing mpg instead of only 35 mpg, or a truck that gets a paltry 20 mpg instead of 10? At only 10,000 miles per year driven, the car saves 86 mpg [sic--should read "gallons"] and the truck — wait for it - 500 gallons! If you drive 20,000 miles per year the later will save you about $3,000.